For five seasons, the TV show “Justified” follow US Marshal Raylan Givens, masterfully played by actor Timothy Olyphant, as he waged a shoot-first-ask-questions-later battle to enforce the law in Kentucky’s rural Harlan County. The genesis of the show’s title is revealed early in the pilot episode when Raylan defends shooting a drug dealer in Miami (which is what ultimately lands him back in his home state of Kentucky) by saying something along the lines of, “He pulled first. The shooting was justified.” A good many of Raylan’s shootings are clearly justified. A good many are not quite so clear, except in Raylan’s own mind. But even in those latter cases, you want to side with Raylan. The show kept my wife and I hooked for five seasons because the writing – and characters – are just that good. Raylan lives in a black and white world. This is complicated somewhat by the birth of his daughter after a brief period of “on again” in his on-again-off-again relationship with his ex-wife. But through it all, Raylan is consistently forward looking. He doesn’t dwell on the past. And he is generally unencumbered by doubt. When he makes a decision, he lives with it. Regret is not only not in his vocabulary, it doesn’t seem to exist anywhere in his brain. All that matters is, “was the decision justified?” Everything else is a distraction. When I was at my best, I approached training and racing in much the same way. A wise friend of mine once observed that it was probably my confidence in my training – rather than any particulars of the training itself – that was instrumental in my success. I tend to think this is probably more true for more folks than it is not. You have to believe that what you are doing is right. You have to believe your decisions are… justified. 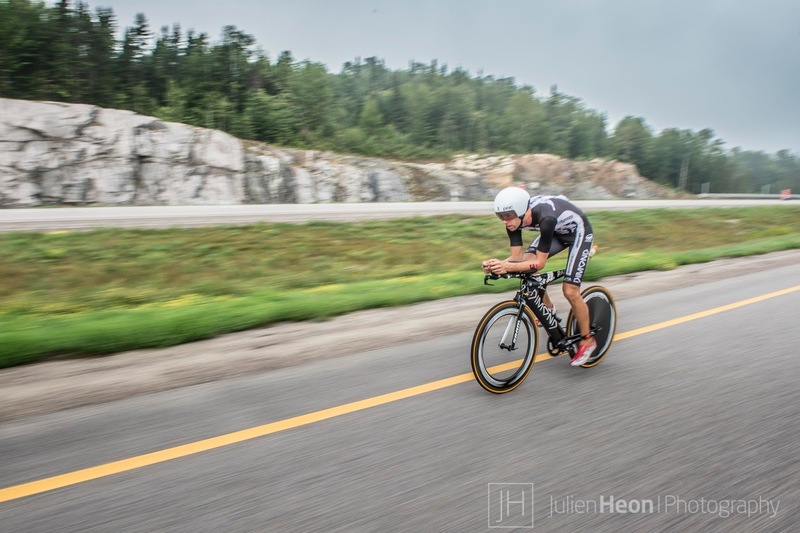 I made two decisions that I feel are representative of the larger way that I approached the race in Mont-Tremblant. They aren’t really related in any direct way, but in other ways, they are very much related. The first was my new helmet, and the reason may surprise you. The priority was NOT aerodynamics. I won one race in the Specialized McLaren helmet – my first race in it. I stopped winning races the same time I started wearing it. Coincidence? To a certain extent. But it was also the first time in my career that I decided to use something ONLY because of aerodynamics. I’d always had more balance than that before. And, eventually, I just lost confidence in the helmet. I felt – sort of – like it was cursed. And when I put it on, I no longer “felt” fast. I used to feel race ready when I strapped on my aero helmet, like Adam doing his “by the power of greyskull…” bit to turn into He-Man. But I didn’t feel good wearing that helmet anymore. The POC helmet seemed well designed based on what I saw and what I read, and I asked if the folks who handle media relations might give me one to try. Originally, I just wanted it to write an update to my LAVA article on short-tailed aero helmets. That was it. They were nice enough to send me a helmet, and when I took it out for a ride and knew right away, “yes.” It just felt right. After that ride and some brief – REALLY brief – quantitative analysis made me confident it was fast, I decided to race in it. It was aero “enough.” I liked the visor (which surprised me). I liked the feel. I liked that it seemed to be a bit more forgiving of head position. And I just felt good – I felt FAST – wearing it. And so I raced in it. As I said to my coach, I just felt like the POC had better mojo. Joel’s reply was, simply, “mojo’s important.” And it seems like he was right, and that it did have better mojo. It was a decision made for a multitude of reasons, and it was a decision I felt could be justified. So I made it. The second one was a decision on how to approach training. I was asked during a pre-race interview about something I wrote on here earlier this year, after Texas, where I said my greatest strength was also my greatest weakness. My discipline and drive and obsession has been why I’ve had success. And also why I’ve had failure. In preparing for yet another Ironman, I knew I was going to have to ask a lot of my family. In many ways, I felt like my family had become my biggest weakness. I had never won a race as a father of three. Could I manage being a parent and being a world class athlete? The answer seemed to be, “No.” But then I thought if my strength could also be a weakness, could I make a weakness a strength? One particular area where I had struggled was in balancing family and training. I felt at times like I was half-committed to both. So I decided to work to change that. I decided I’d only train six days a week. I’d commit one day fully to family each week. I didn’t really change the amount I trained, so I don’t feel like this was one of those examples of mistaking less for more. Joel and I just crammed what had been seven days of training into six. Thankfully, I’ve always been a bit on the lighter side with a “typical” week being about 25 hours of training and just under 30 being a really big week. Many other athletes do more like 35 hours and up to just under (or even just over) 40 hours. I felt that really making a commitment to family on that one day would make it easier to commit to bigger days of training on the long days. I’d had success with this more “polarized” approach – harder hard days and easier easy days – in the past, but never quite to this extent. Nevertheless, I felt the decision was justified and committed to it. And I think it was a positive for me, for Jill, and for the kids. Ultimately, I do think that this approach improved my recovery, but I think it was entirely mental. I was able to get more out of my time off because I was actually off as opposed to half-off. Overall, I believe I did a better job of trusting my intuition, though at times my intuition was very often, “don’t overthink it and just go with the plan.” I tried not only to learn to better trust my instincts, but also to accept that sometimes my instincts didn’t really offer any great insight and to just sort of keep on rolling. I tried not to force things, which more often than not meant not trying to force myself to listen for something that wasn’t there. Most days I just woke up, did my best to execute what was planned to the best of my ability without thinking too much about it, and then went to bed. Wake up and repeat. Of course, as I said to Joel, when things are going smoothly you wonder what the fuss was all about. It’s easy to lose perspective, even when I looked back at how far I came, but perhaps that’s a good thing too. It doesn’t always work out that way. Some risks do not pay off. And you have to be willing to risk it all over again. Perspective is valuable, but a lack of perspective can be equally valuable. Aeschylus said, “there is an advantage in wisdom won from pain,” but the cliche, “ignorance is bliss” is equally true. I was very much on the fence about racing in Kona. But when I thought about my other options, it was hard to justify any of those decisions. How could I not race in Kona? I couldn’t answer that. But when I asked the next question, can I justify racing Kona? Did I perform at a level that makes me confident that I can be top-10? My answer was, initially, much less sure. I believe that it will take a better performance than I gave in Tremblant to be top-10. How much better? That likely depends on a bunch of things beyond my control, mostly weather and luck. But I believe I can be better. I believe I did not reach the limit of what I am capable of. I set out to hit Tremblant as a mid-point in a 15-week build to Kona, and there are just under seven weeks left. My intuition is to put my head back down, get back to work, and see where I end up. I won’t know until I do that whether or not I can be better in Kona. That’s the only way. But committing to that process is the only decision that I see that can be… justified. Hi Jordan. I was struck by the reason to only train 6 days and spend the seventh with your family. Radio talk show host Dennis Prager has a video series on the ten commandments, one of which is remember the Sabbath. He relates not only the biblical meaning, but the suggestion that resting one day a week is very beneficial to the relationships in your life. Racing it temporary but the impact you have on your children and wife by spending that one day of rest, is such a great thing to do. I wish you continued success. It was a pleasure as well as an inspiration to watch you racing in Tremblant, congratulations on your win. Overcoming struggles and setbacks ain't for sissies – respect, my friend. Good luck and better legs in Kona.